HomeBlog March 2014 Get Organized for Spring and a Special Giveaway! Get Organized for Spring and a Special Giveaway! As we continue to celebrate National Craft Month, we've got another awesome giveaway for you! We introduced you to Martha Stewart Crafts® Mad About Color Series, and one lucky winner will win the March 2014 Macaron-Inspired Paint Kit. Keep reading to enter the giveaway at the end of this post. We all know Martha's the go-to genius when it comes to all things home, so we're sharing eight favorite DIY projects that you can do in an afternoon to help you get organized for spring this month! 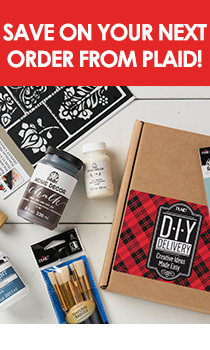 Many of the projects are a perfect fit for the Martha Stewart Crafts® Craft Paint Kit or Decoupage lines, which you can find in the Plaid Store. Be sure to enter the giveaway through March 18th, and share the contest with your crafty cohorts! We're wild about this simple - and doable - project to brighten up your fridge, while making life easier to boot! Is there anyone as creative as Martha that would suggest this chic use of paint cans? We think not. We can't wait to do this one - and imagine the satisfaction of pitching your (done) to-do list at the end of the day! Love this idea for a family calendar or in your home office - so stylish, you'll be thrilled to scribble your upcoming events on here, no matter how packed your schedule. For the organizing gurus among us, these shutters are a lifesaver. Pretty up some tins to get your desk in 'tin-top' shape. Steal a couple extra minutes of shuteye by making getting ready easy in the mornings. Be sure to enter the giveaway below! Like us on Facebook to be the first to know about giveaways and get inspiration!